When I began making my own press-mold porcelain chopsticks (from previous article), I thought a pair of two same length sticks would be enough to quantify as chopsticks. The pair of porcelain sticks perform exactly like chopsticks (as seen below), they can lift food from one place to another. But they are difficult to recognise as chopsticks when not in action. So what signifiers does a chopstick possess that informs the viewer of its authenticity? This video, following the making method of wooden chopsticks provided some key insights. So if I am to produce objects that can be recognised as chopsticks I must achieve all four signs. Potential, and ultimately minimal, decoration could be achieved with a simple enamel glaze in the traditional porcelain style of blue and white. 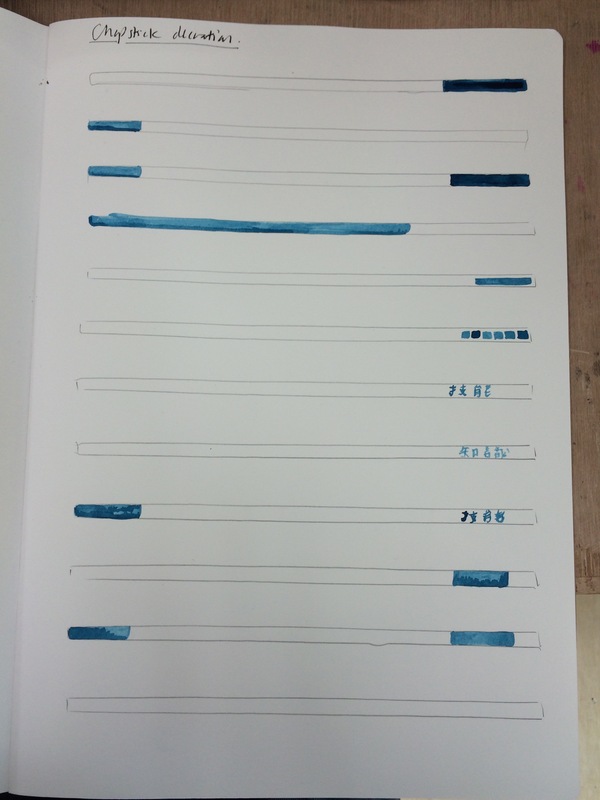 Similarly I am attempting methods to refine the tapering process in order to achieve desirable objects. Potentially these objects could bring opportunities for ceramics to be used in conjunction with convenience meals. 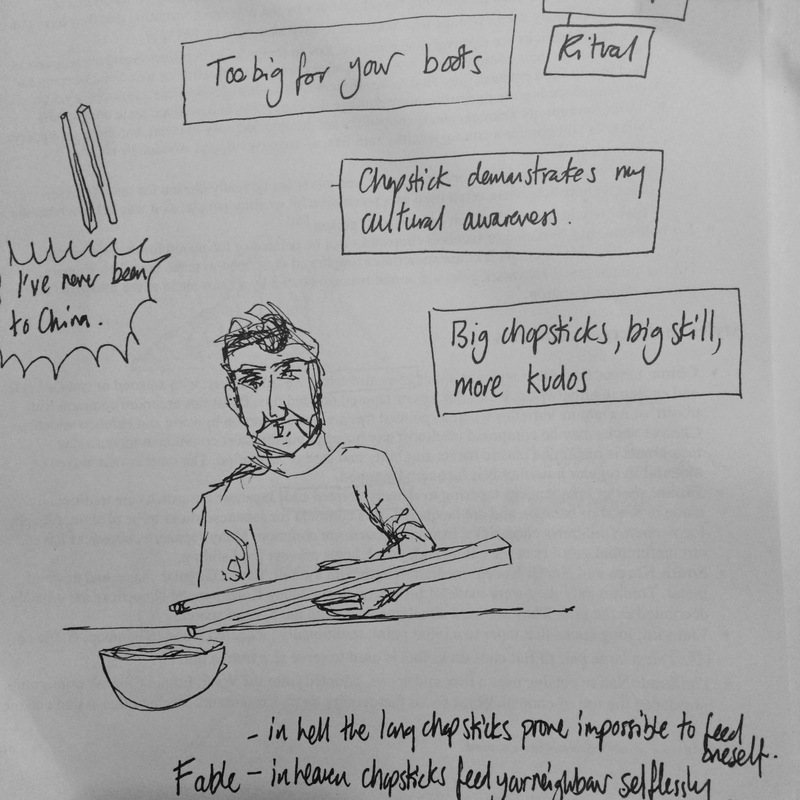 I came across this issue with chopsticks as part of my Man Only Dines research. The use of disposable chopsticks has long been a preferred method of eating in China for convenience and sanitation; particularly since the SARS outbreak in 2003. Normally the use of wood instead of plastic would be advocated, however it is estimated that China produces 80billion chopsticks a year. Thats equal to 20 million 20 year old trees, placing considerable impact on the natural environment. Since 2006, China has imposed a 5% tax as a deterrent to using disposable chopsticks, however it is Taiwan that is taking up the BYO chopstick mantle; as demonstrated in the following images. We need more creative ways to encourage people to switch from disposable chopsticks to reusable ones. She lists a range of plastic, screw together options (similar to those shown above), but none come close to using a familiar, natural material when compared to plastic. The natural answer feels to make the chopsticks out of ceramics, an unusual but pre-existing process. Ceramics can be decorative, easy to clean and has permanence. The ceramic chopstick could be the answer to China’s problem. This famous phrase forms the bases for my new line of inquiry. We live in a world obsessed by what we eat – whether you’re addicted to junk food, whether you overshare great restaurants and recipes on Instagram or are just simply confused about which products suit your ethics. Food is a big part of our contemporary society in the UK. Porridge with blueberries, sultanas and nuts. 2 slices of toast with peanut butter. Mackerel and broccoli stir-fry with rice. The last four helpings were all in the name of art, I promise (more to follow shortly). I can still feel the last bite of the Big Mac trapped somewhere. But what I have just offered up is an opportunity to judge me, and we all do it. We define ourselves by where we eat and what we eat. At my birthday meal last week everyone at the table was using chopsticks proficiently. Being proficient is one thing, but chopsticks are still more difficult to operate…so why use them in place of a knife and fork? I use chopsticks at every oriental meal, I even used them for the mackerel stir-fry I ate earlier…at home. Yet still I was surprised that ten people elected to use chopsticks over a knife and fork. Now, living in a multicultural city is clearly the most obvious reason why every guest at the meal had learned to use this authentic method of eating. Exposure to different foods etc is common in the city. I will normally dine out at least one night a week. One night in a month will easily be pan Asian…and I will use chopsticks. However, what interests me is that I didn’t need to learn this skill. A knife and fork is nearly always offered alongside chopsticks. I only ever used a knife and fork back home on the Isle of Wight and likely it it is still the same for many people today. In most rural areas around the UK it could even be considered pretentious to use chopsticks. The chopstick is quickly becoming an object that speaks of my cultural journey over the past fourteen years. It highlights the differences between my rural upbringing and my present city life, through the food I eat and the tools I use.